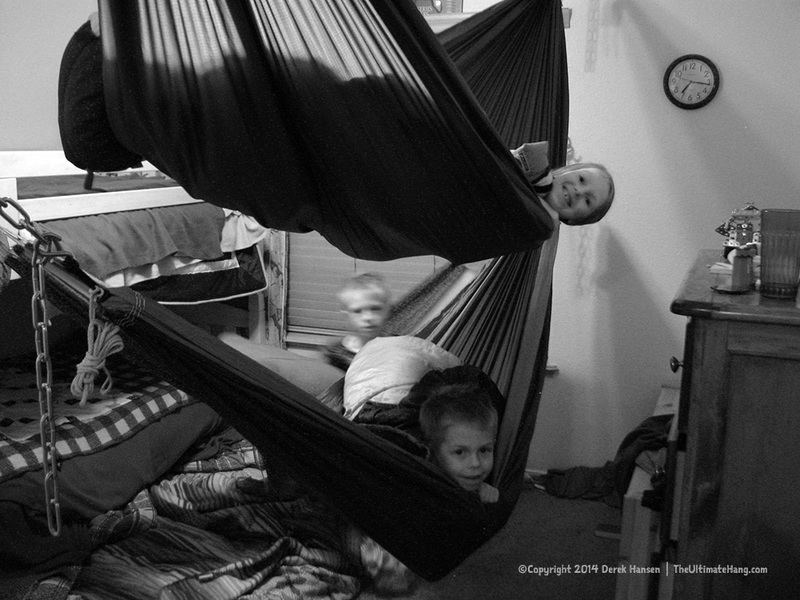 Last night my sons invited me to bunk in their room—I have hammock hooks installed there, so I obliged. My sons are in bunk beds and my hammock crosses the room diagonally, with one end close to the top bunk. Around 1 AM I was awakened to the sound of retching. Oh, the sound! It is the natural “fire alarm” siren for parents and it always goes off conveniently in the middle of the night. What made this event more special was that my son had the presence of mind to lean over his bed while vomiting. The result was a targeted flow of stomach fluids and chunks pouring directly into my hammock. Thankfully, it was on the foot end. I count small blessings for the fact that I was using a synthetic under quilt and a wool blanket on top. I laid patiently in my hammock until my son was done, and while the experience was nauseating for both of us, I had to laugh at the situation and the resulting clean-up work. The indoor hammock makes clean-up of these situations a breeze. A quick chunk rinse down the sink and then everything went straight into the washing machine. I can tell you that washing mattresses is much more difficult. Chalk up another point for hammocks! Sorry to hear about your son–hope he’s doing well. Glad your cleanup was so easy. How do you have your hooks anchored? I’m interested in doing something similar, though maybe not on a diagonal. I definitely don’t want to damage walls or end up on the floor. Is there an easy way to ensure safety? Hey Derek, thanks for the post it was very informative. I too hope your son is doing well. Thanks 🙂 He is over the stomach bug, but it looks like we’re down with some strep variant. Oh well, that’s what having a family is all about. Hi, Derek! I came across your site after ordering 3 hammocks for our kids. We are moving to a small (very small) cabin, and they will be sharing a room. What do you suggest as far as layout in a 10×10 room- lined up or crossing paths somehow? I was imagining parallel diagonal layout. Our thinking was that they could unhook one side to use the area during the day, and string back across for sleeping. Thank you for your helpful site! With a 10 foot or shorter hammock you won’t need to cross the hammocks when they hang with an appropriate sag. But you could, and it would look cool 🙂 the hammock calculator will help. I love the idea of sliding away the hammocks when not in use.